A computer system with a software was designed to obtain air temperatures, velocities and solar radiation data in the classroom. Seven temperature readings were recorded. The graph in Figure 13, shows temperature readings for inside the classroom and air entering — existing the collector. The top vent air (air existing) temperature of the collector on the increase when the sun shines. The difference between the top vent and bottom vent air temperatures is maximum at peak solar collection time on the south (between 12.00-15.00). On clear days the temperature difference is about 25-28 °С. Moreover, air temperature existing the collector is about 25-27 °С higher than the inside temperature of the classroom. As seen in Figure 14 , The top vent air velocity is about 0.5-0.6 m/sn at the same hours. In conclusion, the insulated backing of the solar collector serves the dual function of blocking heat transfer between the classroom and the back of the profiles (and air chambers) and insulating the window area to reduce heat transfer from the classroom to the outdoors. This system provides heat by convection during sunny hours and also reduces heat loss on overcast days. This suggested system has the advantage of not requiring any modification to the existing heating system or of occupying any interior space. The solar energy collector is easy to both install and remove as required. G. Z. Gedik, A. Koyun, T. Yilmaz, (2004). Utilization Of Solar Energy Systems For Retrofit Design Of School Buildings And An Example Application, A research project, The Scientific And Technical Research Council Of Turkiye (TUBITAK), Project No: IQTAG-I241. G. Z. Gedik, (2002). Utilization of solar energy systems for school buildings, (in Turkish), Symposium on clean energy, Vol 1, pp. 259-266, Istanbul. M. Meltzer, (1985). Passive Active Solar Heating Technology, New Jersey, Prentice Hall Inc.
 G. Z. Gedik, A. Koyun, T. Yilmaz, “Utilization of Solar Energy Systems for Retrofit Design of School Buildings and an Example Application” 4th European Conference on Energy Performance and Indoor Climate and 27th Conference of the Air Infiltration and Ventilation Centre (EPIC 2006 AIVC), Lyon, Vol.1, 115-120, 20-22 November 2006. R. Casasola1*, D. Romero1, J. Alonso1, J. M. Cejudo2. A possible way of increasing the efficiency of solar collectors is to optimize the heat transfer between the fluid and the inner surface of the absorber tubes. There are several approaches to solve this problem, but one of the simplest and cheapest solutions is the passive method. Enhancing the heat transfer by this procedure has received a strong attention during the last decades. Many studies have demonstrated that there is a significant increase in the Nusselt number by using different devices as flux breakers or turbulators. It has been well established that the turbulent flow created facilitates an efficient transport of heat to the tube wall. Passive methods have also the advantage that there is no need of additional external power. In particular, in this work we have studied the insertion of turbulators into the absorber. Based on previous studies that claimed a 50% gain of convective coefficient in copper tubes, a proportional increase of the collector efficiency is expected. Extensive empirical tests have been made to evaluate the effect of these elements in the collector efficiency, measured according to EN 12975. Keywords: absorber, heat transfer enhancement, tabulator, efficiency. A solar absorber can be considered as a special type of heat exchanger. Industrial heat exchangers usually operate in turbulence or swirl flow, where their performance is higher than in laminar flow. The aim is to increase the heat transfer between the fluid and the inner wall of the pipe. There are two main reasons to explain this energy transfer enhancement: the inherent higher transfer coefficients of turbulent flow and the larger effective heat transfer area. According to the classical model of the flat plate solar collector , there are two main strategies to improve the collector efficiency: to increase the optical gain or to reduce the thermal losses. In the first group, we can enumerate the use of anti-reflective glasses, high absorbing coatings or new absorber designs. In the second group, double glazed collectors, selective coatings and better thermal isolation materials. Each of these alternatives have different advantages and disadvantages in terms of costs, final application, durability, appearance, etc. the heat transfer between absorber and fluid. The typical absorber configuration with sheet and tubes can be improved. Moreover, this option has the important advantage of increasing the efficiency without raising the stagnation temperature, what reduces durability problems. There have been numerous authors who have studied heat transfer enhancement by means of insertions into the tubes, mostly using air like heat carrier fluid. Promvonge and Eiamsa  described the use of twisted tapes and conical inserts, Ray  studied the use in square ducts, etc. Many experiments and theoretical analyses have been done and empirical correlations have been obtained. In this article we have prepared an application of the use of tabulators in solar absorbers, using an empirical approach. We have selected the most promising alternatives in terms of material costs and processability, and we have made several tests to evaluate its effect in terms of collector efficiency. Examples of integrated storage collector (ICS) of polymeric materials are displayed in Fig. 9 (a) shows an ICS with polypropylene casing and transparent insulation of cellulose triacetate. The ICS in (b) has a moulded storage container in polyethylene, glazing in polycarbonate and heat ex­changer in copper. Example (c) is a recent Brazilian ICS product with polymeric components and available in four different sizes. The ICS system in (d) consists of a cylindrical tank under a trans­parent dome of PMMA with an inner, upper shell of PC and an outer, rear shell of HD-PE. The storage tank is of stainless steel with selective coating and has reflectors of aluminium to the sides and below. A recent development is a glazed “solar store”, an inflatable, rollable take-away unit with 30 l volume, generally for DHW preparation and particularly for camping and caravanning holidays or for hot water preparation in remote locations (e). The flexibility in design and shaping due to polymer processing techniques, low weight and easy installation are some of the major advantages of polymeric materials for collector frame and cas­ings. Fig. 10 (a) illustrates a deep-drawn collector casing in PC with bracket anchor for collector mounting. Example (b) shows a collector corner profile of glass-fibre reinforced plastics and ex­ample (c) collector-frame profiles in wood plastic composites. A collector with metal-based ab­sorber in form of a building-integrated roof tile of glass fibre reinforced plastics (UP+GD+MD) is presented in example (d). Within Subtask A of IEA-SHC Task 39 many other structural designs of polymeric applications for solar collectors have been reported, e. g. fittings, manifolds, applications at prototype level and patented ideas. In general, the U-value is assumed to have a linear dependence on AT as shown in Eqn. 4. In order to predict the fraction of the solar irradiance that is absorbed in the collector, previous knowledge about (ra)e is used. This makes it possible to identify both U1 and U2 by plotting the right side of Eqn. 3 against AT. The only unknown parameter on the right side is the heat capacity. When the heat capacity term is set to zero, the U-value is apparently larger before solar noon than after solar noon. The heat capacity is chosen so that the derived U-values before and after solar noon coincide. This approach to graphically determine the heat capacity will be shown in Section 5. Ui and U2 are then determined by using a least square fit (minimizing the sum of the squared residuals). It is emphasized that there is a difference between the coefficients U1 and U2 in the present paper and c1 and c2 in EN 12975 . The relation between the two constants is c1 = F’ U1 where F’ is the collector’s efficiency factor. F’ is close to unity for the present collectors in the present study (and generally for most polymeric collectors), hence the difference disappears. Fig. 8. Calculus diagram for daily axis forces. Table 3. Loads on the A axis. Table 4 presents the loads on the D axis and the forces on the bearings. Table 3. Loads on the D axis. Loads on the elements of the equatorial tracking system with linear actuator have been calculated for the six loading cases and for the six wind cases. The dimensions of the tracking system, involved in calculus are: l = 1480 mm; e1 = 40 mm; e2 = 85 mm; a = 160 mm; l1 = 600 mm; e3 = 80 mm; e4 = 140 mm; d = 125 mm; l2 = 50 mm. Figure 8 presents the reactions on the bearings and on the linear actuators for two loading cases (a — loading case 1 and b-loading case 6 — see table 2), for which the biggest reactions result. There have been considered the possible wind cases, numbered from 1 to 6, presented in table 1. Figure 11 presents the reactions on the bearings and on the linear actuators for all six loading cases (see table 2). There have been considered the wind cases 2 (a) and (4), presented in table 1, for which the biggest reactions result. • The bigger axial load on the screw’s actuator C is maximum for loading cases 4 (tension) and 2 (compression) and wind case 2 (fig. 11, a); The bigger axial load on the screw’s actuator E is maximum (tension) for loading cases 1 and 2 and wind case 2 (fig. 11, a). R. N. Clark, B. D. Vick, Performance Comparison of Tracking and Non-Tracking Solar Photovoltaic Water Pumping Systems, Presentation at the 1997 ASAE Annual International Meeting Minneapolis, Minnesota (1997). http://www. cprl. ars. usda. gov/REMM Publishers. htm. D. Diaconescu, I. Visa, B. Burduhos, V. Dinicu, The Incidence Angles of the Trackers Used for the PV Panels’ Orientation. Part I: Equatorial Trackers, International Conference on Economic Engineering and Manufacturing Systems RECENT, Vol. X (2007). A. Roger, J, Messenger, Photovoltaic Systems Engineering (2004), CRC Press, Boca Raton. C. I. Co§oiu, A. Damian, R. M. Damian, M. Degeratu, Numerical and experimental investigation of wind induced pressures on a photovoltaic solar panel (2008) International Conference on Energy, Environment, Ecosystems and Sustainable Development, Algarve, Portugal. NP-082-04. Eurocode 1. Design Code. Bases of Design and Actions on Buildings. Action of Wind. Monitorul Oficial al Romaniei. Table 2. Material data and allowable stress for Copper and Aluminium. Allowable levels of stress in glass are counted with time dependency and distribution of brittleness and by these two reasons the stress in a glass when used as a construction material never shall exceed 8-9 MPa . Since a construction never will be stronger than its weakest point we also defined a weakest safety factor as in (5).
 . The elements in the mesh were up to 20*20 mm. A sensitivity analysis where done in order to see which factors had most affection of the stresses in the material. The sensitivity is a dimensionless number describing the response of the disturbance, e. g. if you make a disturbance of 1 % and the response is -1.9 the stress in that particular case will be reduced by 1.9 %. Material in absorber was copper. The result is compiled in to table 3. The x and y both have trends that seem complex and needs more analysis for understanding. z is more or less proportional i. e. all trends ~ 1. Selection of material and thickness in absorber affect the price / thermal performance relation. That relation will not be questioned in this article, instead geometry properties of tubes and absorber will be kept constant on common used values described in table 1.
tg have trends that seem complex and needs more analysis for understanding. Eg will not be further investigated since there are no real good alternatives to soda glass with better price / thermal performance relation. As mentioned above, the properties of the small test absorber are not directly scalable to larger absorbers. 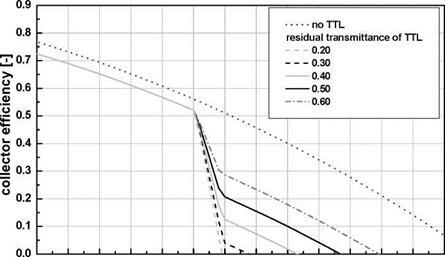 In  Treikauskas compares the simulated pressure drop of an optimized roll-bond absorber (harp absorber, 985 mm x 1925 mm) with state-of-the-art absorbers and with the measurement results of the small FracTherm® test absorber (590 mm x 1000 mm). However, it is difficult to compare the pressure drop of absorbers with different sizes. The pressure drop of a large FracTherm® absorber cannot yet be anticipated, and for a given volume flow it will probably be different from the small one. Therefore it will be very interesting to compare the large FracTherm® absorber to be developed with another large, optimized roll-bond absorber with a different channel design. The development of the header channel is an important task with respect to connectivity and pressure drop. In order to have a first estimation of the pressure drop in a flat, wide header channel, simple analytical calculations of 1 m long channels with different rectangular cross sections were carried out. The channel width b was varied from 50 mm to 150 mm, the height h from 2.95 mm (height used in small test absorber) to 4 mm. The results for different volume flows Q are shown in Fig. 5. The change from laminar to turbulent flow is obvious: the pressure drop rises with Q according to a linear function in the laminar region and approximately according to a power function in the turbulent region. Fig. 6 shows both the pressure drop for different rectangular cross sections for a volume flow of Q=0.36 m3/h and the cross sectional areas. It can be seen that same cross sectional areas (which means same fluid volume and thus thermal capacity) lead to different pressure drops. The example in the diagram reveals a pressure drop difference of about 24 % for A=300 mm2 (see dashed arrows). It is evident that for a given cross sectional area the pressure drop becomes lower with increasing h/b ratio. But it is a question of technical feasibility whether the height of the channels can really be increased. The results of the FracTherm® test absorber investigations carried out earlier are not directly scalable to standard size collectors. Therefore the main challenges of the European project BIONICOL are the further development of the FracTherm® program, the development of appropriate heat transfer fluids in order to prevent corrosion, the adaptation of a glass batch coating plant for coating solar absorbers, the development of concepts for header channels and the interconnection of collectors and finally the field tests to be carried out for one year in different sites in Europe. Some first rough calculations of the pressure drop in rectangular channels were already carried out. They can serve as a basis of dimensioning roll-bond header channels with a given maximum channel height. The contract for the BIONICOL project was not yet signed when this paper was written. This is the reason why the project partners are not mentioned by name. The consortium applied for the project in the call FP7-ENERGY-2007-2-TREN within the Seventh Research Framework Programme (FP7) of the European Commission. Solar radiation energy is incident on the collector at its aperture area Aaperture. This radiation Gglob, i consists of direct and diffuse radiation and is measured in the plane of the collector aperture. Two types of losses occur: optical losses and thermal losses. The terms used in eq. (1) are explained in detail in  and . It depends on the construction of the collector and on its working temperature which kinds of losses are dominant and therefore have to be reduced. In general, optical losses occur at the transparent cover of the absorber due to absorption and reflection as well as at the absorber by reflection. If reflectors are used, additional optical losses due to absorption and diffuse scattering of the reflected radiation have to be taken into account. The optical losses include all incident solar radiation that does not reach the absorber of the collector. After absorption of the remaining part of radiation, convective losses occur due to natural convection in the gap between the absorber and its cover as well as due to forced convection by wind passing the cover. Conductive losses appear in the gap between the transparent cover and the absorber as well as through the back insulation or the frame of the collector. Both types of losses can be nearly eliminated by placing the absorber inside of a vacuum. Radiative losses of the absorber rapidly grow with increasing working temperature of a collector. to reduce losses were considered and new types of collectors were developed. The „Ray-Tracer” software uses the Ray-Tracing method to study some physical phenomena and is useful to study and simulate the mechanisms that take place in the solar radiation concentration process from the non-imaging photovoltaic concentrators. The paper presents results of simulated experiments regarding the concentration of the radiation by a paraboloidal photovoltaic concentrator installed on the roof of a house in the insolation conditions of a clear sky day. The geometric characteristics of the paraboloidal photovoltaic concentrator are: parameter p = 200 mm, input aperture radius R = 50 mm, height h = 62.5 mm, focal distance f = H0 = 10 mm, geometric concentration factor Cgeom = 6.25. The photovoltaic cell is placed in the focal plane of the paraboloid and has the radius r = 20 mm. The photovoltaic concentrators are placed on the roof oriented South, у = 0, and the inclination is equal with the latitude of the place 5 = 45 deg. The maximum value of the incidence angle on the input aperture to which the concentration produces is 6max = 30.06 deg. For the given case, the minimum value of the incidence angle is reached at noon in September, 6min = 1.507 deg. The theoretical factor of optical concentration is Coptic, teoretic = 3.98. For the given situation, the maximum optical concentration factor is Cmax = 3.57 in September at noon. The optical concentration factor, in the described experiments, is higher than 1 between 1030 o’clock and 14 o’clock. 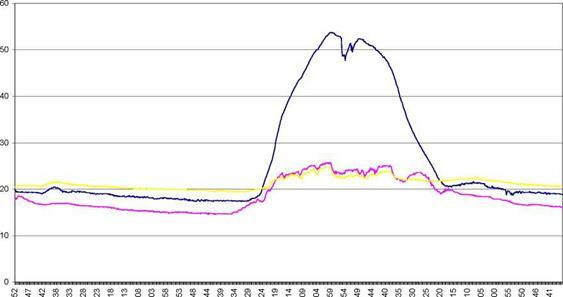 The maximum density of the solar radiant flow on the photovoltaic cell is reached in March, at noon, Brec = 2837 W/m2. The efficiency of the concentration varies between 12.31%(June) and 26.10% (September). A photovoltaic installation with the collecting area of 12.50 m2, with 5000 paraboloidal concentrators, provides monthly the electric energy quantity variyng from 71 kWh, in December, to 383 kWh, in March. The electric energy production satisfies the the need of a family and allows the monthly delivery, in spring, summer, autumn and winter of approximately 125 kWh to the national energetic system. The following papers will refer to installations with paraboloidal concentrators at which the distance between the parabola’s peak and the photovoltaic cell is variable. The purpose of these papers is to determine the optimum position of the cell depending on the paraboloid’s peak so that the optical efficiency to be higher that 1 for a longer period of time. Swanson, R. M., Photovoltaic concentrators in Photovoltaic science and engineering edited by Luque, A. and Hegedus, S., Wiley, pp. 449 — 505, 2002. Bowden, S. B.E., A High efficiency photovoltaic roof tile, a thesis of University of New South Wales, April 1996. Brogren, M., Optical efficiency of low-concentratingsolar. Energy systems with parabolic reflectors, Uppsalo University, Sweden, 2004. Winston, R., Principles of Solar Concentrators, Solar Energy 16, pp. 89-95, 1974. McIntosh, K. R., Swanson, R. M., Cotter, J. E., A simple ray tracer to compute the optical concentration of photovoltaic modules, Progres In Photovoltaics: Research And Applications, 14, pp 167 — 177, 2006. Gray, J. L. , The physics of the solar cell concentrators in Photovoltaic science and engineering edited by Luque, A. and Hegedus, S., pp. 61 — 113, 2002. Glassner, A. , ed. An introduction to ray tracing, Academic Press, San Francisco, pp. 263—294, 2002. Emery, K., Measurement and characterization of solar cells and modules concentrators in Photovoltaic science and engineering edited by A Luque, A. and Hegedus, S., Wiley, pp. 701-753, 2002. Nilsson, J., Optical design and caracterization of solar concentrators for photovoltaics, Lund University, Licentiate Thesis, 2005. Danescu, Al., Bucurenciu, S., Petrescu, St., The utilisation of solar energy (in Romanian), Ed. Tehnica, 1982. Fara, L., Tulcan-Paulescu, E., Paulescu, M., Photovoltaic systems (in Romanian), Matrix, 2005. Paulescu, M., Schlett, Z., Practical aspects in the photovltaic conversion of the solar energy (in Romanian), Mirton, 2002. De Sabata, C., Luminosu, I., De Sabata, A., Palea, A., On the Design of a Solar, Partially Energetically Independent House in the Region of Banat, Bul. St. Univ. "Politehnica" din Timisoara, Transactions on Mechanics, 52(66),4, 2007, pp. 82-87, ISSN 1224-6077, . Luminosu, I., De Sabata, C., De Sabata, A., Theoretical and experimental researches over the posibility of realizing a solar house that is partially independent thermoenergetically (in Romanian), Buletinul AGIR, fondat 1918, ISSN 1224 — 7928, XII, nr. 3, iulie — septembrie, 2007, pp.31 — 44. Paulescu, M. , Algorithms for estimating the value of the solar energy (in Romanian), Matrixrom, Bucuresti, 2005. Luminosu, I., Zaharie, I., Costache, M., Damian, I., Optical concentrators in photovoltaics installations, Conferinta Nationala ”Instalatiile pentru Constructii §i Confortul Ambiental”,183 — 190, Timisoara, martie 2007. Luminosu, I., Zaharie, I., Costache, M., Damian, I., Ray-tracing — an analysis method of optical concentrators, Conferinta Nationala ’Instalatiile pentru Constructii §i Confortul Ambiental”, pp191 — 199 , Timisoara, martie 2007.
produced at the Polytechnics University in Timisoara, Bulletins for Applied and Computer Mathematics, (PAMM), Budapest University of Technology and Economics, BAM Nr. 2173, pp. 135 — 146, 2004.
absorber temperatures of ~160°C and ~175°C at ambient temperatures of 0 and 30°C, respectively. It is observable that the stagnation temperatures can be controlled by the use of thermotropic layers. To achieve maximum absorber temperatures of 90°C, switching temperatures of the thermotropic film between 55 and 60°C are required. A slight effect of the ambient air temperature on the efficient working temperature range is discernible. At elevated ambient air temperatures of 30°C the efficiency drop is shifted to lower temperatures. However, the efficient working temperature exceeds 60°C even at an ambient temperature of 30°C. Thus the overheating protected collector is appropriate for domestic hot water and space heating applications. In Fig. 2 the effect of the thermotropic layers switching range on maximum absorber temperatures at a solar irradiation of 1000W/m2 and an ambient air temperature of 20°C is shown. The residual solar transmittance of the thermotropic layer in opaque state is varied between 0.20 and 0.60. The transmission of the layer in clear state remains constant at 0.85. Compared to layers exhibiting a solar transmittance of 0.90 in the clear state (Fig. 1), the collector efficiency is shifted to slightly lower values. As to layer design, this indicates that the solar transmittance should exceed 0.85 in the clear state. The collector without thermotropic overheating protection reaches absorber temperatures of about 160°C. 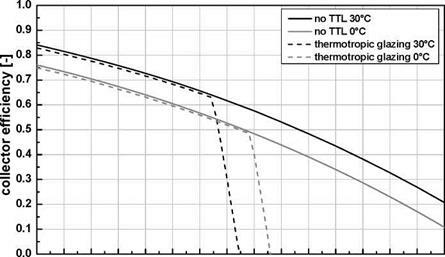 It is observable that by applying thermotropic layers exhibiting a residual transmittance of 0.30 to 0.35 the absorber temperatures do not exceed 90°C. Layers exhibiting transmittance values above 0.35 lead to a successive increase of maximum absorber temperatures up to 130°C for a solar transmittance of 0.60 in the scattering state.